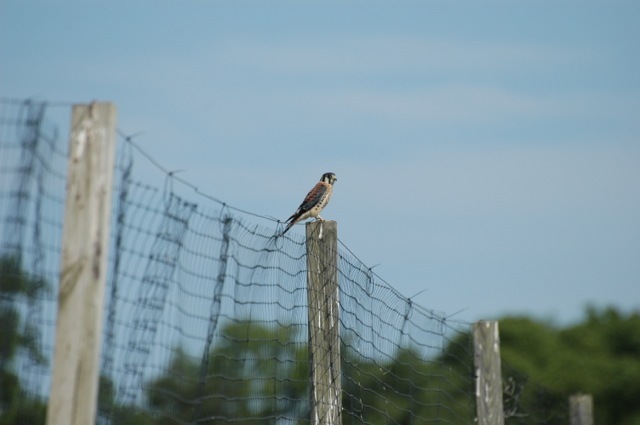 For all our readers who love birds, too, we have an update on the kestrels that live in our vineyard. Pete and Tacie have spotted a total of 6 of these beautiful little falcons soaring in the skies above our 27 acres of grapes. Tacie managed to get some photos of them, too. While we are not sure how many of the special houses we built for them are occupied, clearly they recognize our fields as home. We welcome their predatory presence, as it eliminates the need for canons and other noisy devices we have utilized in the past to control the bird species that destroy our fruit. The kestrel condos are just one of the ways our vineyard crew, led by manager Thom Bechtold, have implemented more sustainable growing practices in our quest to be environmentally-friendly. Minimal spraying of pesticides, fungicides, and herbicides, as well as soil management techniques have become standard operating procedures in the field. This may not be the easiest way to grow wine grapes, but we all take pride in knowing we are doing the right thing for the land…and the kestrels!